Powered by data collected by Qriously, a startup that leverages mobile ad infrastructure to deliver questions to millions of people across the globe, the index provides a snapshot of the general attitude towards bitcoin at the time of questioning. In order to gauge public attitudes to bitcoin, Qriously reaches out to members of the public in the UK and US via its mobile polling service. In terms of numbers, 85 people are asked the question per day in the UK and 50 in the US. Fifty responses per day is the minimum required to have statistically significant distributions of answers with a seven-day moving average, Kahler said. Qriously then computes a relative ‘sentiment’ score by adding the percentage of positive results to 100 and subtracting the percentage of negative results to create an index value. Instead of daily values, a seven-day moving average is used. The question itself is served in the place of a mobile advertisement unit on both iPhone and Android users, who are selected at random to reflect the average smartphone-using population (as a proxy for the general population). While currently opinions are gauged from individuals in the UK and the US, CoinDesk hopes to expand the geographical range of the survey to other countries in the near future. 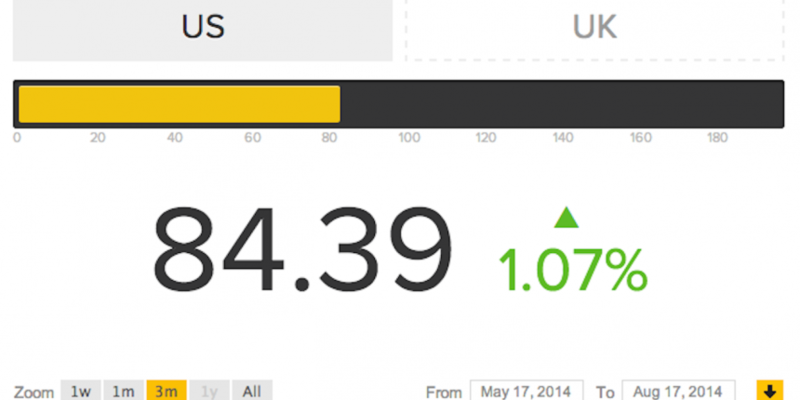 CoinDesk already provides the Bitcoin Price Index, an up-to-the-minute average price for the digital currency based on data from carefully selected major global exchanges. However, while following the price of bitcoin can be interesting, at times perplexing and sometimes profitable, looking at general attitudes to bitcoin should provide a different kind of insight into state of bitcoin, now and in the future. “The popular opinion, as opposed to expert opinion, for bitcoin is interesting and its utility is intrinsically tied to widespread adoption,” said Kahler. 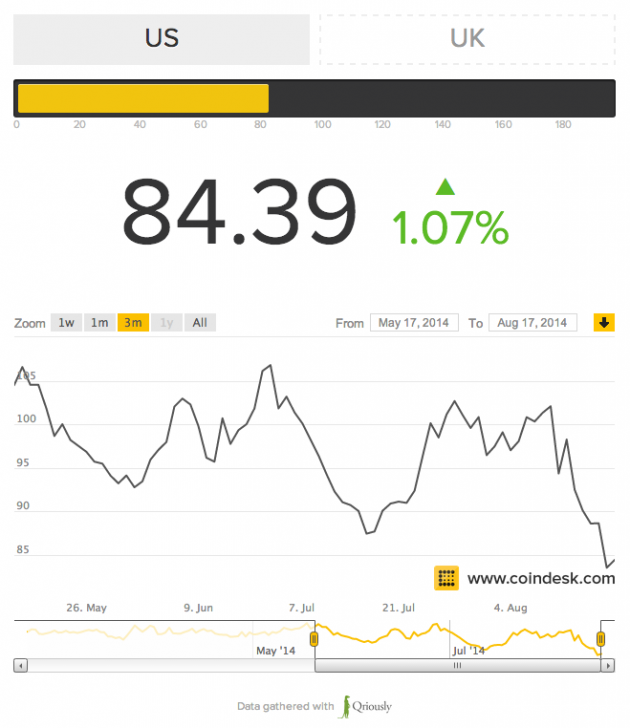 Visit the Bitcoin Sentiment Index here. The sentiment index is something of an experiment for CoinDesk and we value any feedback our readers may have on its value and potential improvements. Please email comments to contact@coindesk.com.